The Beauty of Life: Beauty Question: How Do You Hide Redness After Eyebrow Waxing? Beauty Question: How Do You Hide Redness After Eyebrow Waxing? We've all been there -- we go for an eyebrow wax at a less than opportune time and come out beet red. Since I'm exceedingly pale (sometimes I think Casper is darker than me), I tend to stay red for HOURS. 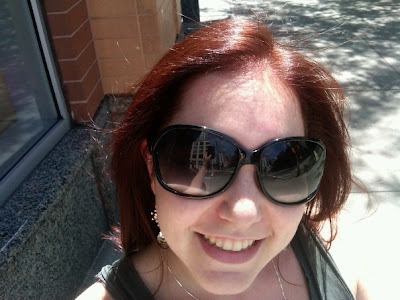 I've discovered that the best way to hide my redness is with the most oversized sunglasses I can find -- which lately are my beloved Banana Republic Heather Sunglasses (seen above with my new red locks from Jan-Marie!). I love that they're so big they literally cover my entire eyebrow -- thus hiding any unfortunate redness from the rest of the world! How do you hide redness after waxing? Let me know in the comments!